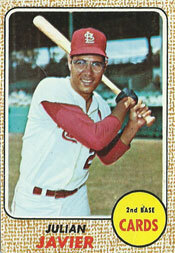 The 1968 Cardinals were stocked with players known for producing high drama. Bob Gibson. Lou Brock. Roger Maris. Orlando Cepeda. It was a supporting cast member, though, who delivered a storybook home run. On May, 15, 1968, second baseman Julian Javier visited Mark Sandusky, 6, of McKeesport, Pa., at Children’s Hospital in Pittsburgh. The youngster’s legs had been crushed in a car accident. Javier often visited children in hospitals, The Sporting News reported. Javier’s visit impressed the boy, who asked the Cardinals’ second baseman to hit a home run for him that night against the Pirates, the Associated Press reported. “You’d better use a heavier bat,” the 6-year-old replied. Javier, who hadn’t hit a homer that season, did the improbable. Like a scene from “The Natural,” Javier hit Steve Blass’ first pitch of the fourth inning into the light tower next to the left-field scoreboard at Forbes Field, according to the Associated Press. Javier wouldn’t hit another home run until three months later, Aug, 28, 1968, also at Pittsburgh, against Roy Face. Javier finished the season with four homers. In a 13-year major-league career, Javier hit 78 regular-season home runs.